I have a travel and adventure bucket list. I want to go to Thailand, I want to skydive over Israel, I want to do Yam L’Yam (a three-day trek from Israel’s Mediterranean coast to the Sea of Galilee), and so much more. Something you probably don’t know about me: I am an adrenaline junkie! I have gone skydiving, hang gliding, cliff diving, rappelling, canyoning, zip lining, and probably anything you else you can think of that involves jumping off of things! I even jumped off a building in Auckland, New Zealand, and honestly, that was one of the more tame things that I have done. Anyways the other bucket list I have is for food. Not food that I want to try, but food I want to learn to make! There were small things like my own thin-crust pizza dough which weren’t much trouble. Then there were slightly larger things, like when I learned how to cook sous vide and when I made my own vegan cheese for that short period of time I attempted to avoid dairy (that didn’t last very long, but the cheese turned out great). Tip #1: Under no circumstances should you attempt to mash your potatoes in a food processor. This was a complete and utter disaster. I had to throw away the potatoes since they became completely unworkable. So, mash your potatoes with a potato masher or a good old fork. It’s totally okay if there are some lumps; in fact, it’s probably even better if there are, it means you’re still far away from over-mashing your potatoes into a sticky mess. Tip #2: Don’t stress when rolling out your potato ‘rope’. If they rip, they rip, you don’t need it to be one long rope. You’ll be cutting it up anyway. Tip #3: Constantly rinse off your fork after every 10-20 gnocchi pieces, as the sticky residue will cause them to not look as pretty. Tip #4: Watch my tutorial at the bottom of this page to learn how to shape the perfect gnocchi! That’s it for the gnocchi, now on to the sauce! There is a restaurant near me that makes an amazing pasta sauce that I am obsessed with. It has pumpkin, chestnuts, truffle, sage and parmesan. How amazing does that combination sound?! I decided I was going to try to recreate something like that for my gnocchi, and it was a huge success! While I had to skip the truffle since I couldn’t find a KFP version, I did top off the whole dish with some garlic confit for some added oomph. Place the potatoes in a pot and cover with water. Cover the pot and bring to a boil over a high flame. Lower the flame and simmer for 25-35 minutes, or until fork tender. Drain the potatoes and mash with a masher or fork. Dust a clean work surface with a little bit of potato starch and place the mashed potatoes on top, allowing them to cool. Meanwhile sift together the potato starch, almond flour, salt, pepper, and garlic. Once the potatoes have cooled, create a well in the center. Add the eggs into the middle and sprinkle the starch mixture around. 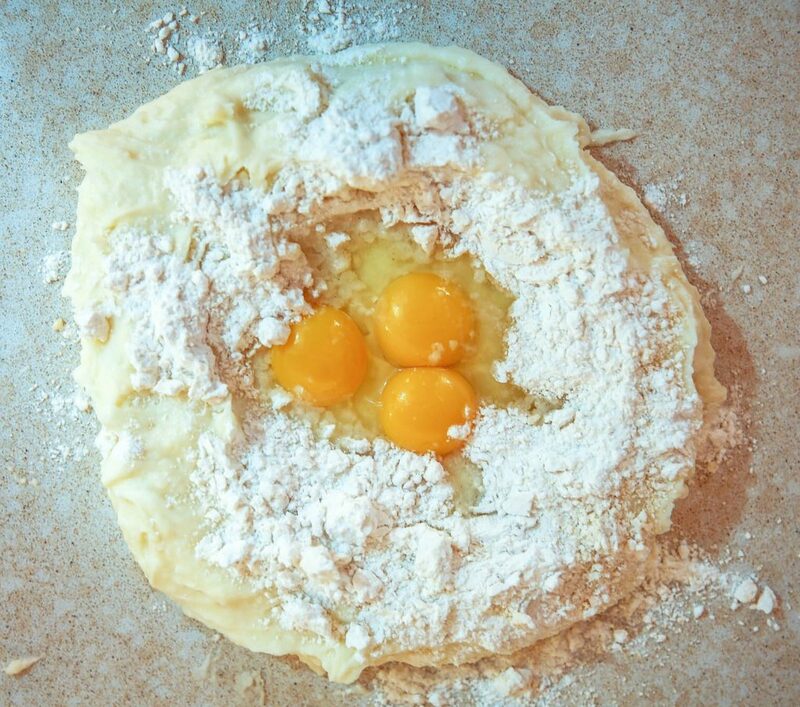 Starting at the walls of the well slowly fold the potatoes and starches into the eggs, continuing until everything is mixed together, forming a smooth but slightly sticky dough. Form the dough into a ball, cover with saran wrap and place in the refrigerator to chill for 30-40 minutes. Bring a fresh pot of salted water to boil. Remove the dough from the fridge and split into 6-8 pieces. Starting with the first piece, gently roll out into a 1/2 inch rope/snake. Using a bench scraper or a knife, cut the rope into 1/2-1 inch pieces. Place a fork on the counter with the tines touching the counter so the back of the fork is in the air. Place a piece of gnocchi at the top of the fork arch. Take your index and pointer finger and place them on top of the gnocchi. Applying a little bit of pressure roll the gnocchi down the fork tines so that it gets the fork indents. Repeat until all the pieces from the rope are indented. Add the shaped gnocchi pieces to the boiling water and wait for them to float, should take 30-60 seconds. Wait another 1-2 minutes and using a slotted spoon remove the gnocchi from the water and place in a colander to drain. Repeat step 4 until you have used up all your dough. Rinse the gnocchi off gently in the colander, like you would pasta. 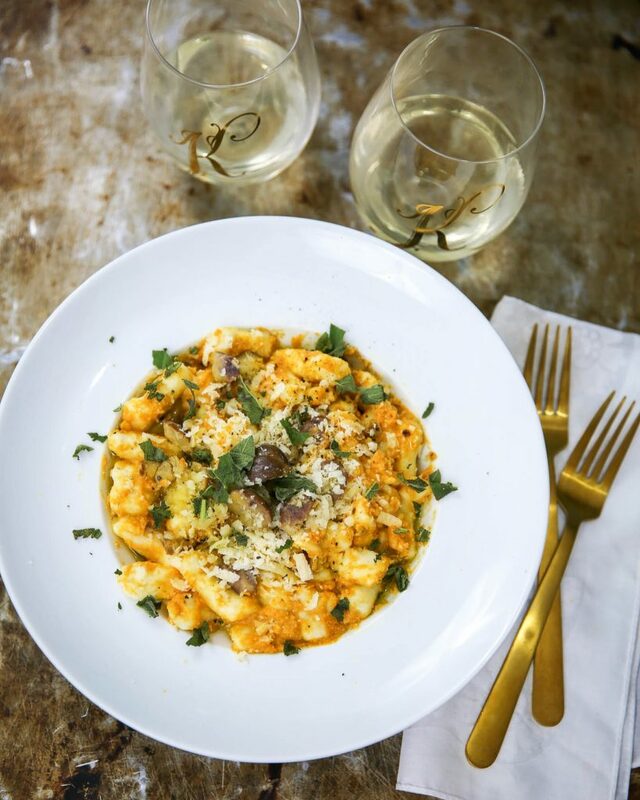 While your gnocchi rests in the fridge make your pumpkin sauce. Heat up the olive oil in a sauce pan over a medium flame. Add in the shallots and garlic and sauté for 2-3 minutes, until fragrant. Add in the pumpkin, milk, heavy cream, and wine, mixing until well combined. You may need to adjust the milk depending on how thick or thin you want your sauce. Add in the mozzarella, salt, nutmeg, cayenne and fresh sage and mix until everything is melted and combined. Mix the gnocchi with the sauce and plate. Top each plate with roasted chestnuts, freshly grated parmesan cheese, garlic confit and fresh sage. Eat with a glass of semi-dry white wine. Tip #1: Under no circumstances should you attempt to mash your potatoes in a food processor. This was a complete and utter disaster. I had to throw away the potatoes as they had become completely unworkable. So mash your potatoes with a potato masher or a good old fork, it's totally okay if there are some lumps, in fact, it's probably even better if there is, it means your still far away from over-mashing your potatoes into a sticky mess. Tip #2: Don't stress when rolling out your potato 'rope'. If they rip, they rip, you don't need it to be one long rope, you're anyways cutting it. Tip #3: Constantly rinse off your fork after every 20-30 gnocchi pieces as the sticky residue will cause your gnocchi to not look as pretty. 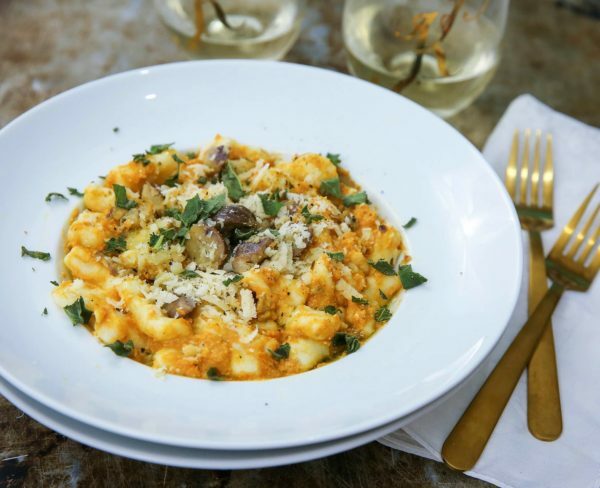 Can the gnocchi be made in advance? Without the sauce obviously…! I haven’t tried it, so I cannot promise, but it should be fine!